This little entrée en matière (introduction) to make you feel more comfortable when you want to cook an easy "four-course menu". When I cook our daily four-course meals, the only thing I really focus on is le plat principal. Because l'entrée is going to be some sort of crudités (or a soup); the fromages (or in our case, mostly yogurts) require extremely limited, if any, preparation; and if dessert is a piece of fruit, then it's easy. N'est-ce-pas? 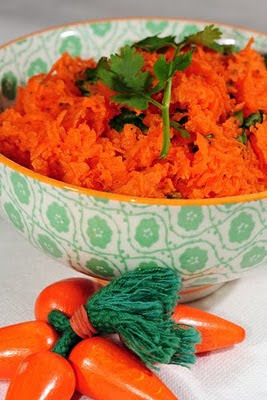 Carottes rapées (shredded or grated carrots) are a very traditional French entrée. As I already mentioned on my post on coleslaw, French eat a lot of carottes rapées. It is fairly common to see them on the lunch menu in a café/bistro or in school/workplace cafeterias. I started serving shredded carrots to my children when they were about two. Before age one, I tried to limit the amount of raw vegetables (the only thing they ate raw was avocado, which does not have a really raw-texture to me)... but after that, once they were used to chewing, I introduced other raw vegetables for their entrée. I like my carottes rapées very very thin (I shred them using my hand grater as I find that my food processor does not shred them thin enough; but for the sake of speed, I have used my food processor as well!). Shredding them really thin is the key to enable your children to chew and swallow the carottes. Since they taste a little bit sweet, children generally like them. The traditional French dressing for crudités is a vinaigrette. I serve carottes rapées with a tratitional vinaigrette with Dijon mustard, red wine vinegar and olive oil. Some people add black olives, shallots, green onions, lemon juice, garlic or other ingredients to their carottes rapées... I generally add some fresh flat-leaf parsley, fresh cilantro or, when lucky, chervil (one of my favorite herbs) for the taste and contrasting color. The only thing I try to pay attention to is the quality of carrots. I have tasted the difference between the fresh carrots bunch and the other loose carrots. And since you are going to serve them raw, it might just be a good idea to spend a little bit more money and more time selecting them. Because, even if your four-course menu is simple, it would be a pity to spoil l'entrée! Bon Appétit! What a healthy and yummy salad as a starter! A great idea to encourage kids to eat more carrots. Les enfants adorent aussi le céléri rémoulade avec les carottes râpées... Mais là on triche, on l'achète chez le traîteur! Et of course... c'est moins "healthy" que les carottes, mais quel succès! Hooray! I used to enjoy this dish whenever it was served by the French family I lived with in Paris...back in 1994! I never managed to search for the recipe. Now I have one at my disposal. Thank you!